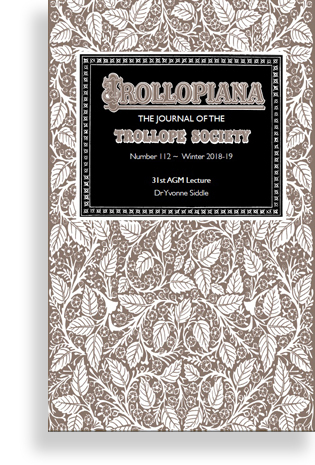 Dr Yvonne Siddle gives the 31st Trollope Society Annual Lecture. Michael Williamson describes the search to identify sites in modern-day Prague that may be related back to Trollope’s own perambulations through the city and his novel, set in the city, Nina Balatka. We remember Martin Chown and Henry Ong. Mark Green studies the complex character whose appearances through the Barsetshire series of novels always provoke a strong reaction in readers. Mrs Proudie was standing with Mr Slope in front of the signora, and had been trying to be condescending and sociable; but she was not in the very best of tempers; for she found that, whenever she spoke to the lady, the lady replied by speaking to Mr Slope.